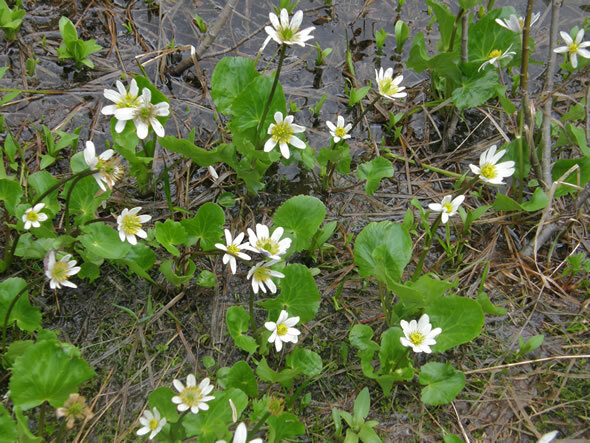 Alpine Marsh Marigolds, Caltha leptose, thrive in a wet, boggy zone. We hope you enjoy this month's celebration of nature and photography. Which kind of trees are used to make turpentine? 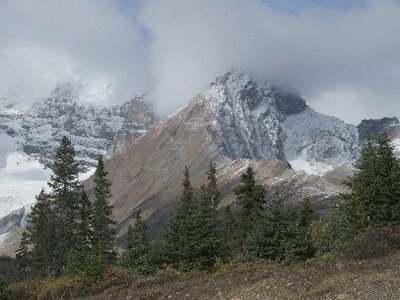 We have added 52 pages of online jigsaw puzzles using the Pictures of the Week from 2013. You are invited to challenge yourself! 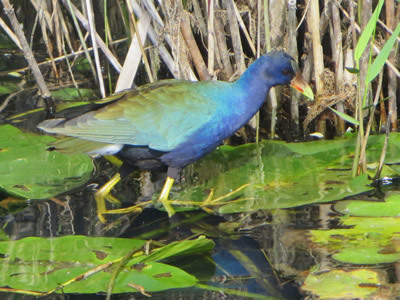 Purple Gallinule in the Florida Everglades. 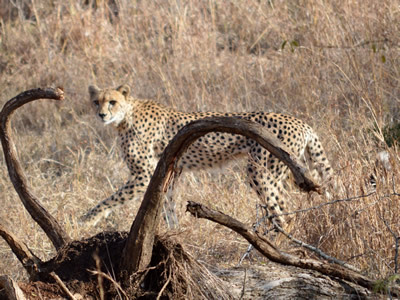 Georgia, saw this beautiful Cheetah. 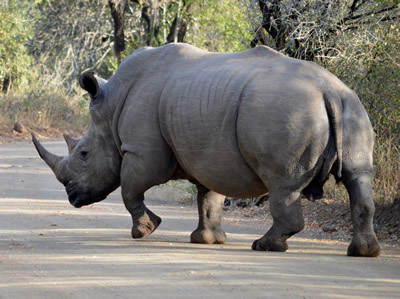 Holly also sent us this photograph of a hefty White Rhinoceros. 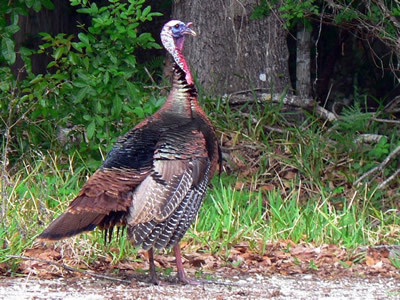 This Wild Turkey seems to be showing off for Marilyn Flanagan of Florida. these super images for everyone to enjoy! In the Shadow of Peaks is a hike up to the alpine meadows of the mountains to see some of the alpine flowers that survive harsh conditions and short growing seasons. 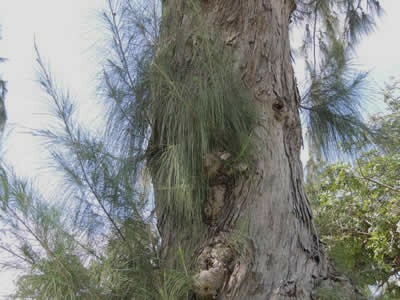 This month we visit Hawaii which always has some interesting plant life. This unusual tree is a Persian Ironwood tree, Parrotia persica, and is a native of Iran. Number one: "Hey! Do you want one of these?" Number two: "No one's looking, so I'll pop back for the others.'" 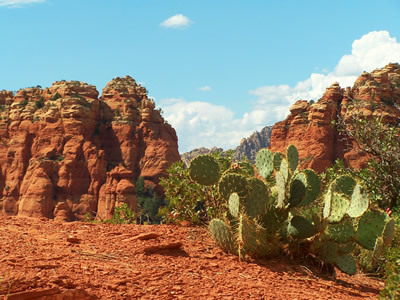 taken in Arizona's Red Rocks of Sedona. What a gorgeous spot! 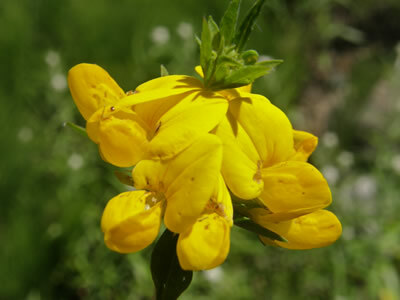 This interesting-looking plant is called Bird's Foot Trefoil, Lotus corniculatus. It is a member of the pea family of plants and is a low-growing perennial introduced to North America from Europe. Its genus name, Lotus, comes from Greek mythology where lotus was a fruit with the ability to make whoever ate it, forget where he or she lived. However, what this has to do with this plant is a complete mystery! The species name, corniculatus, means 'horned' and is believed to refer to the shape of the flower. 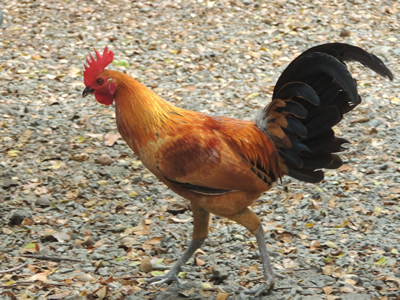 A chicken was wandering peacefully along a road pondering life when it spotted another chicken on the other side of the road. "Excuse me! How do I cross the road?" called the first chicken to the second. The second chicken thought about this and answered, "You are across the road." "Boy, there sure are some dumb bunnies about not knowing where they are!" We are really happy to have recently received four images to complete our State Butterfly page. Thanks so much for helping out. You can see the page by clicking here. Also, our State and Provincial Insects page is just about completed, thanks to the three images we were sent including Quebec, the only Canadian province with an official insect. All we need now to complete the page is Oregon's state insect which happens to be a butterfly: the Oregon Swallowtail Butterfly. If you are able to help out by contributing this missing image, it would be really appreciated. You can check out the page by clicking here. Thank you! 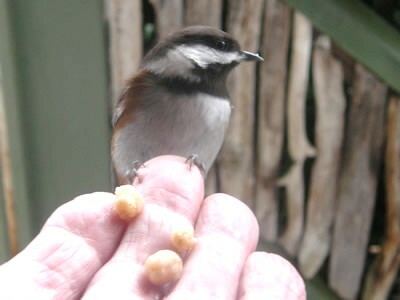 Don't forget to provide your bird visitors with a source of clean, fresh water. 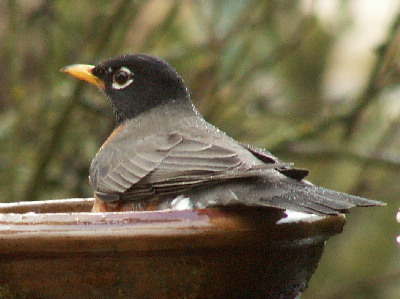 Birds drink and bathe in the same dishes so be sure to give those dishes a regular cleaning with some mild soapy water followed by a good rinse. The birds will be really thankful. some birds had a bit of trouble eating them. 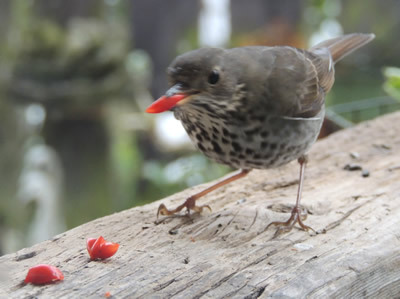 This Hermit Thrush was one and would grab a berry and take it away to consume. Since we wanted to watch the visitors consume the food on the feeding station, we chopped up the berries. 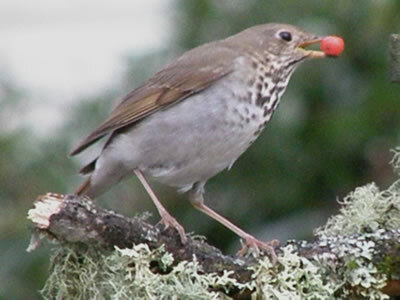 Now the Hermit Thrush hangs around a bit longer to eat. September 4. We have more details and information here. Did you know that the beaver has the amazing ability to gnaw while underwater? 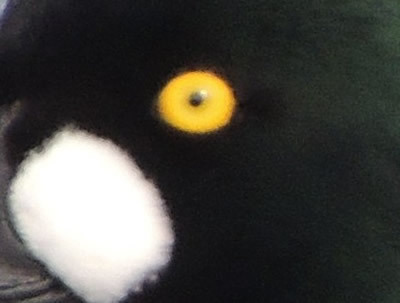 To do this the beaver's lips can close behind its incisors. 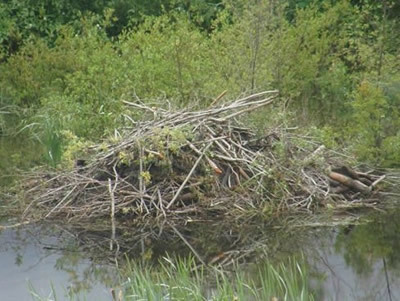 This comes in handy when building a dam or a lodge like this one. 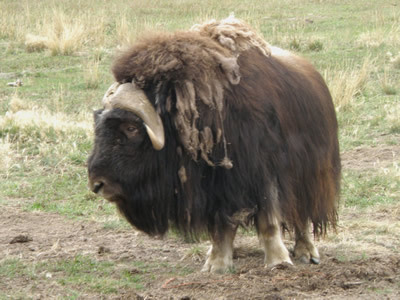 States and provinces have official mammals, birds, insects and other symbols. 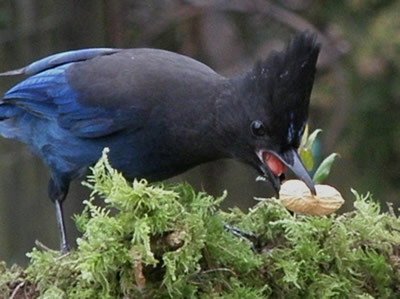 Georgia also has an official state crop: the peanut, a favourite food of this Steller's Jay. 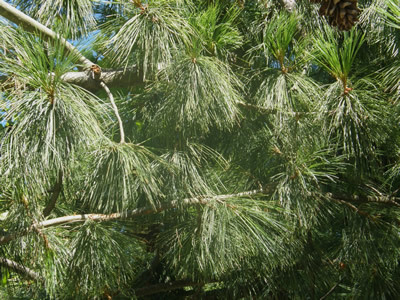 The resin of some pine trees is used to make turpentine. 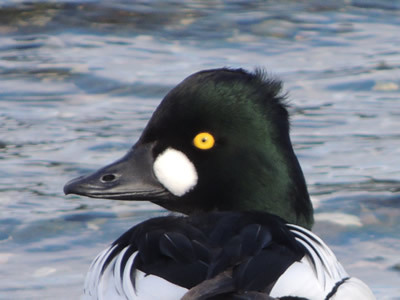 This month's mystery close-up is a duck, the Goldeneye. We hope you've enjoyed our newsletter for this month and that you'll forward it on to your nature-loving friends. Until next time, may you enjoy many wonderful encounters of nature. We are taking a bit of a summer break and will be getting out about into nature's wonderful world, so the next issue of Whispers will be in your inbox in September. Have a fantastic summer!